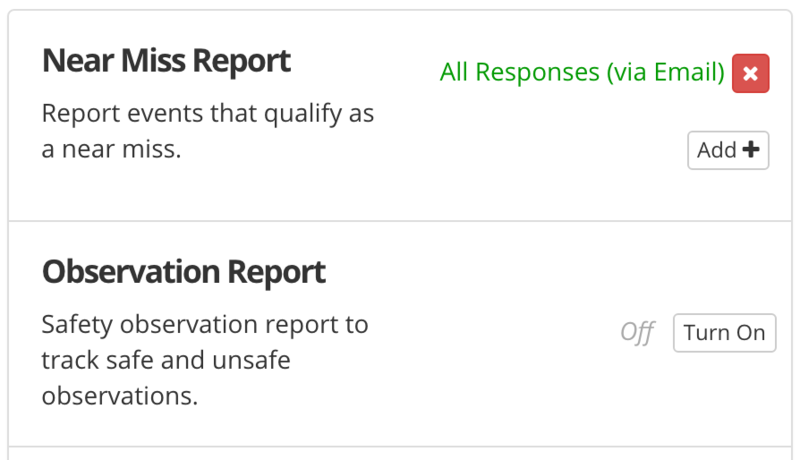 You can receive a notification via iPhone, Android, and/or email when Hazard Scout reports are submitted. First go to the "Report Notifications" page. You can find it within the Hazard Scout website > My Profile > Notifications > Edit Reports ( Learn More). To create a notification, press the "Turn On" button then choose the type of notification (iPhone, Android, and/or Email). If you wish to receive all responses, press "Save". To filter the responses you receive, press "Add a condition..." and choose which question/answer to receive notifications for. You can add additional filters by pressing the "and..." or "or..." buttons. Press the "X" to delete a condition. Press "Save" when you are finished. New Responses - You will be notified if the response matches your filter. You setup an iPhone alert for all "Critical" reports. A report is submitted with "Low" severity. You would not receive an alert because the severity wasn't "Critical". Later a manager edits the response and changes the severity to "Critical". This edit would alert you because now the response is "Critical". Later another manager edits the response to fix a typo in the description. This edit would not alert you because it had already notified you about the "Critical" severity. Nothing about the severity changed.